I work across photography, video, digital, and performance. The interests underlying all my work are the tensions between the individual and the place and circumstances they inhabit, and the human mind in conflict with itself. In visual media, I design an aesthetic representing an individual’s thought processes, using a precisely crafted audio-visual mood and rhythm to trap the audience into their subjective experience. My performance mixes popular alt-drag cabaret with live-art aesthetics to question gender identities, and portray individuals fighting restrictive social norms. In past projects Ghost House and Disciplinary Institutions, I depicted abandoned empty spaces as psychologically charged by looking for traces of their long gone inhabitants. 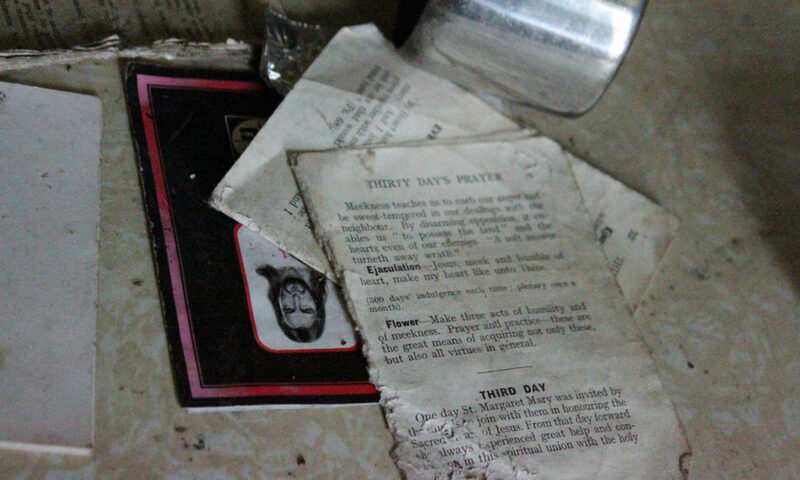 Ghost House explored abandoned houses in Ireland and reflected on Catholicism and rural exodus. Disciplinary Institutions (after Michel Foucault) explored places where people were made obedient through the pre-emptive repression of any deviation from the norm (mental asylums, Magdalene laundries, workhouses). In current projects, I explore individuals’ unique relationship with gender roles, and how it may relate to their yearnings and aspirations. Tricyclic Transform, started as as a photography and video-performance, evolved in a full-length solo queer musical cabaret show, exploring genderqueer identity through song and drag. It premiered at Brighton Fringe 2017, toured to Paris Dreams Before Dawn Festival in July 2017 and I’m interested in touring the show elsewhere. I also do short drag cabaret acts as Sebastian Marmite, the bedsit aesthete, and Miss Liliane, biologically challenged Drag Queen. I hold a MA Digital Arts with Distinction from Camberwell College of Arts, University of the Arts London, and trained as a jazz and cabaret singer with Paul Sand. I show work in exhibitions, galleries, film festivals, clubs as well as traditional performance venues. I have exhibited internationally, including at the Royal West of England Academy, FILE Electronic Arts Festival (Brazil), Electrofringe Festival (Australia), Optica Festival (Spain & Argentina), Portland Experimental Film Festival and featured on the website of the Photographer’s Gallery London.